New research shows that the frequency of extreme storms in the Sahel has tripled in the last 35 years, apparently in response to global climate change. In Burkina Faso, this period has also been marked by large-scale urbanisation, but accompanied by low levels of investment in flood-resilient infrastructure and management. The combination of these processes has led to a sharp increase in flood frequency and damage, with significant socio-economic impacts across the country. The impacts have been particularly severe in Ouagadougou, notably in the major flood of 2009, when a record-breaking 263 mm rainfall was recorded in the city, and tens of thousands of people were displaced from their homes. Both climate change and urban expansion are expected to continue to drive an upward trend in flooding in the future. The new scientific understanding will be vital to informing the development of climate information and products that can support appropriate planning for Ouagadougou city, to strengthen the resilience of the city’s people and infrastructure to enhanced understanding of increasing future flood risks. In developing the AMMA-2050 proposal, the 2009 flood event in Ouagadougou quickly became a key reference point. Stakeholders wanted to understand whether climate change played a role in this damaging event, and importantly, whether it was likely to recur in the future. At the same time, scientists wanted to understand what was driving the apparent increase in heavy rain events. We therefore brought together a team of researchers to analyse past records (including rain gauges, satellite measurements and reports of flooding in newspapers) to try to understand historical trends and place them in the context of global warming. As we investigated this further, we realized an important message was emerging – that the characteristics of storms in the region have been changing remarkably rapidly. We recognized that the rapid warming observed in the Sahara in recent decades was affecting the atmospheric environment in which Sahelian storms develop. Contrary to conventional thinking, the data highlighted changes in wind rather than moisture as the key to driving trends in storm intensity. Such an effect had not previously been observed anywhere in the world. At the same time, analysis of floods reported in the Burkinabe press showed an increase in flood occurrence from typically one per year during the 1980s to 5 per year in the most recent decade. As in the rest of Africa, urbanization has certainly played an important role in this trend. However, the work shows that the impacts of climate change on flood frequency are already being felt in this region. 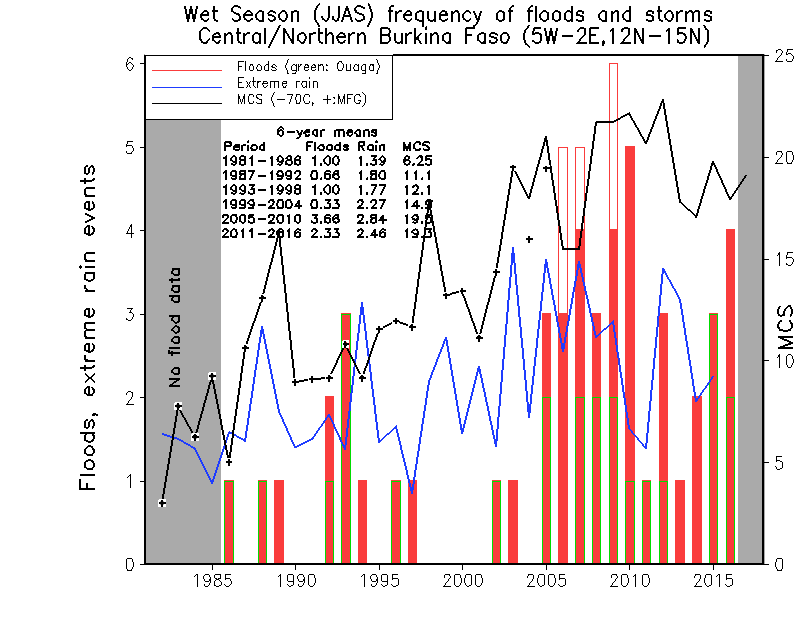 Figure : Annual time series of extreme rain (blue line), intense Mesoscale Convective Systems (MCS; black line) and reported flood events (red bars, data only available 1986-2016))in the Sahelian zone of Burkina Faso. Identification of a strong trend in extreme storms, and its links to global climate change, highlights the importance of the AMMA-2050 pilot on strengthening urban flood-resilience in the face of climate change. The analysis of historical flood events reported in the Burkinabe press showed an increased flood occurrence in the past 30 years. This occurrence can be linked in part to the increase in extreme storms. 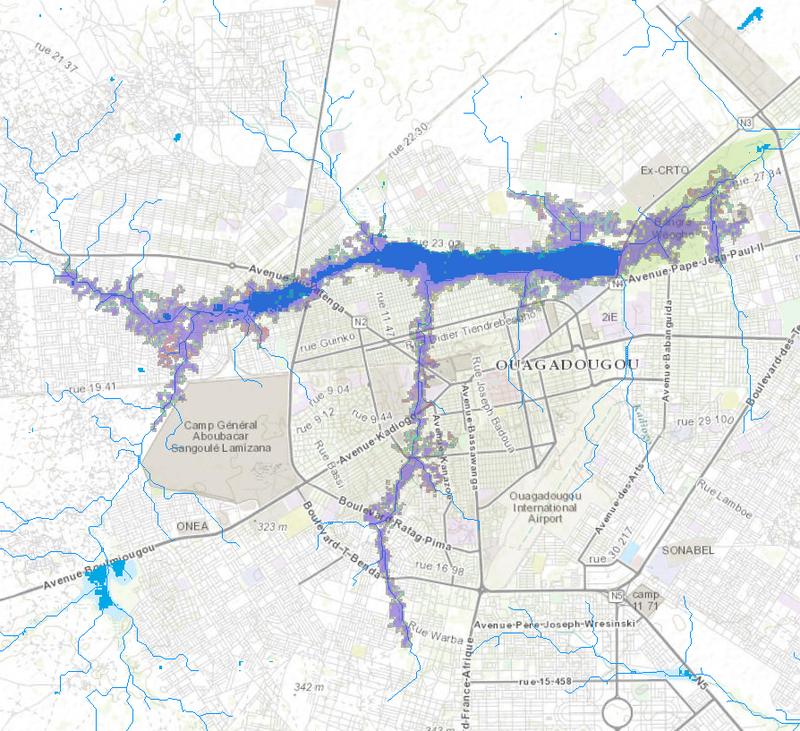 It has led AMMA-2050 to develop methodologies for mapping inundation across Ouagadougou from intense storms, taking account of changes in land use and climate. Hydrological modelling allows us to explore how flows and inundated areas may change in the future at the city level in response to climate and land use change. To achieve this goal, collaboration between AMMA-2050 project and RainCell project was initiated. RainCell focuses on hydrological modelling for operational short-term forecasting in Ouagadougou. The projects are therefore complementary, and the data collected by these projects (rainfall and flow) are used as inputs to the hydrological framework modelling to simulate flooding in Ouagadougou. AMMA-2050 is convening a meeting of national and city decision-makers and technical advisors in May 2018. Emerging scientific learning will be shared and a series of sample flood risk maps will be discussed with participants to identify the information, type and format of visualization and communication that can best support their planning. The analysis has illustrated the important contribution that climate change is having to the historical trend in Sahelian flooding. Importantly, the work highlights the key atmospheric drivers of the change in storm characteristics, allowing us to assess the representation of these processes in climate models. We have identified the crucial effect that changes in the north-south temperature gradient across North Africa have on developing storms. Climate models run for the historical period present a fairly consistent picture showing the increase in greenhouse concentrations to date have warmed drier regions (such as the Sahara) more than wetter regions (e.g. Equatorial Africa), thus increasing the temperature gradient. Moreover, the models tend to agree that these regional differences in warming will continue in the coming decades. However, current climate models are unable to simulate the detailed physical processes within storms which in reality link a stronger temperature gradient with more intense rainfall. This means that whilst conventional climate models can provide useful information about how the temperature gradients driving intense rainfall will evolve in the future, using their rainfall projections directly to inform planning likely underestimates the impact of climate change. On the other hand, the new African climate simulation produced by the FCFA IMPALA project does capture the physics of storms much more realistically. In AMMA-2050, we are therefore using outputs from this simulation to look at how extreme storms will change in a much warmer climate, and use this information to assess flood risk in Ouagadougou. At present urban planning for Burkina Faso’s capital city, the "Grand Ouaga" plan, is far from coherent. Land use is not well managed and there are significant sanitation problems, including management of rubbish, sludge and wastewater. The provision of climate information will enable decision-makers to have appropriate tools to plan and develop the "Grand Ouaga" plan. The AMMA-2050 project also highlights the vital importance of taking into account the most vulnerable populations who generally occupy the flood-prone zones and areas that are designated to be kept clear of occupation because they are flood-outlets. The key factor that enabled this new scientific understanding to be of direct relevance to, and immediate support for, strengthening flood-resilient urban planning was the nature of the funding from the FCFA programme. The programme demanded a focus of climate science on user needs. A strong focus on flooding was clearly expressed by African consortium members and stakeholders during the development phase of the proposal. However, understanding how extreme rainfall will change in the future is a particularly challenging problem for climate scientists as their primary tools (climate models) are notoriously poor at simulating intense storms. 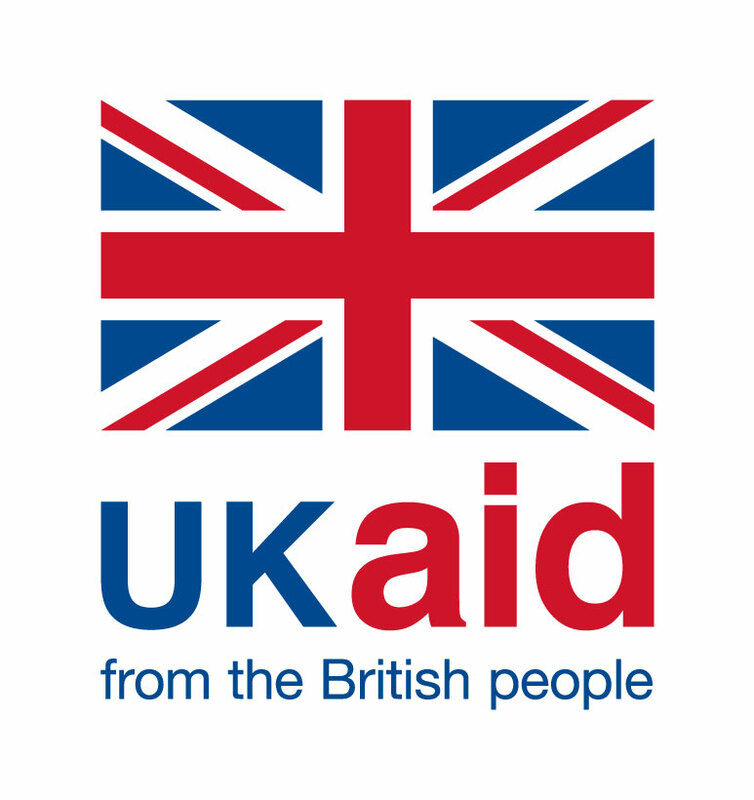 On the other hand, the programme provides significant funding for tackling difficult climate science questions, allowing us to bring together specialists in climate and hydrological modelling and observations. Moreover, with the availability of a state-of-the-art climate model capable of realistically capturing storms from IMPALA, we are much better placed to go beyond understanding the past, and say something about the future. Framing our work in the context of user needs and the decisions different sectors face has been challenging but has driven both users and researchers to communicate more closely. Understanding the practical urban planning requirements in a city like Ouagadougou and knowledge of the limitation of existing climate information has driven our researchers towards novel investigations they might not have otherwise pursued.